FAKRO created the new intuitive website www.fakro.com. Fulfills the latest trends in web design and allows easy access from mobile devices such as tablets and smartphones. We invite you to visit our website. high functionality (performance of products can be compared). Compliance with the latest trends in web design is ensured by Responsive Web Design technology which allows easy access to the website from mobile devices such as tablets and smartphones. 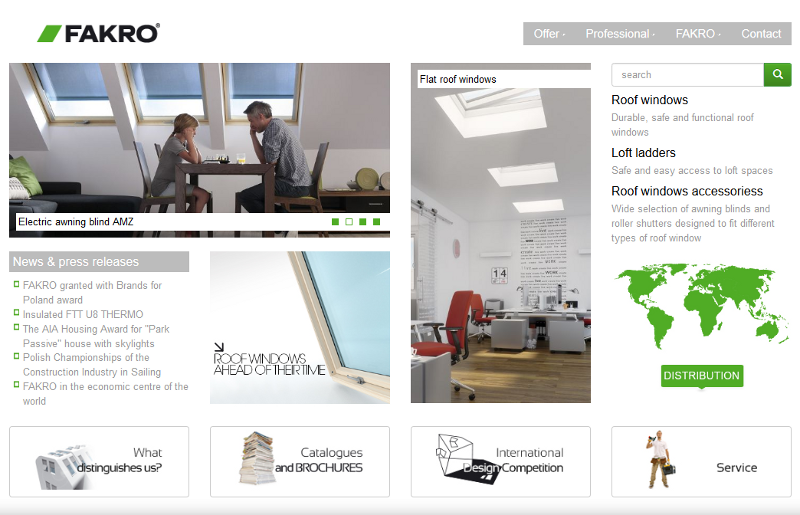 The main objective of a new website is clear presentation of FAKRO offer which has been achieved through intuitive product structure, clear content and attractive graphic design. New website also contains news about the company as well as information and materials to be download by professionals. Individual client will easily find a dealer and fitter of products in his country. The website is also connected with video channels and social media: YouTube, Facebook. A new website is designed to provide the users with comprehensive knowledge regarding products and solutions applied in them as well as to provide all the necessary information on activities carried out by FAKRO. Modernisation of the website is the result of dynamic growth and increasing innovation that determine strong position of FAKRO brand on the market.